Meixian Airport (IATA: MXZ, ICAO: ZGMX) is an airport serving the city of Meizhou in Guangdong province, China. 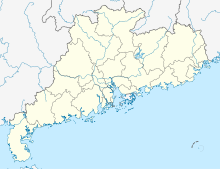 It also called Meizhou Meixian Changgangji International Airport and commenced operations on 1 September 1987. Meixian Airport is served by the city bus network through routes 3 and 11 (both routes towards downtown Meizhou).